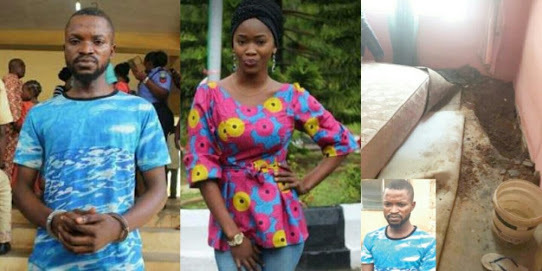 He allegedly strangled his fiancee, Khadijat Oluboyo, 24, dismembered her, buried her in a grave he dug in his bedroom, and slept on the decomposing corpse for six days. The suspect is a son of a bricklayer, Alhaji Alani Alao, who hails from Osun State. Neighbours described the suspect’s father as a Muslim, gentle and easy-going until the ugly incident which had ridiculed the family. It was learned that he was joined that night by two other suspected ritualists to kill the victim. For the six days that he was sleeping on her corpse inside the room, the suspect was reportedly spraying both insecticide and perfume to subdue the offensive odour oozing out of the decomposing corpse. A night to her death, both lovers, who started dating five years ago when they met at Adeyemi College of Education, Ondo, went to a restaurant for dinner and branched at a drinking joint before they retired to the lover boy’s New Oke-Aro extension residence. But the prayers of Muslim clerics on the request of the victim’s father, who is a staunch Muslim, exposed the suspect as he became uncomfortable on the sixth day and had to confess his murderous act. The suspect just completed his National Youth Service Corps, NYSC. However, his quest to get rich quick made him kill Khadijat after a native doctor in Ondo town reportedly informed him that the money ritual he was requesting for will require some human parts of a very close acquaintance. He, however, regrettably settled for his fiancée. The lady reportedly rushed down from her school, Adekunle Ajasin University, Akungba, Akoko to Akure to keep a date with the suspect without informing her friends in school where she was heading to. This, however, suggested that she might have been hypnotised by the suspect. Even her parents, who live in Akure, had no inkling that their daughter was in town. They believed she was in school writing her final year project. But by that time, the victim was already murdered and buried while the killer fiancé sent a message to her parents to fake that she was kidnapped and that they should await how much to pay for her ransom. The same fiancé equally joined them in the search for the deceased. He told the deceased’s younger sister that her sister left his house in Akure for Lagos. He alleged that two other persons, who he did not mention their identities, joined in killing the victim. Findings showed that the other accomplices are the native doctor and a friend, who introduced him into the Yahoo Plus Club. The suspect confessed that he was the one that dug the grave and put her corpse into it and covered it up. He said the crime was committed when neighbours were busy watching a World Cup game, adding that he also turned on his musical system to suppress the sound of the digging.